This majestic Claddagh ring is inspired by the ancient castle which bears its name in Cong, Co. Mayo. This exquisite Ashford Claddagh ring is cast in 18 karat white gold with a heart shaped ruby in the centre. It has a total of twelve round brilliant cut diamonds in the hands, cuffs and crown. 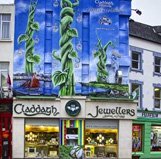 Claddagh Jewellers - Home of the Authentic Claddagh Ring™ - From Galway with Love!